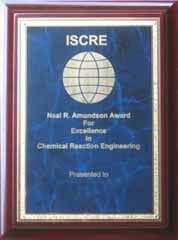 In 1996, the ISCRE Board of Directors established the Neal R. Amundson Award for Excellence in Chemical Reaction Engineering. This award recognizes a pioneer in the field of Chemical Reaction Engineering who has exerted a major influence on the theory or practice of the field, through originality, creativity, and novelty of concept or application. The award is made every three years at an ISCRE meeting, and consists of a Plaque and a check in the amount of $5000. The Amundson Award is generously supported by a grant from the ExxonMobil Corporation. Nominations for the Amundson Award are solicited approximately six months before the ISCRE or NASCRE meeting. ISCRE meeting participants or members of the AIChE CRE division may submit nominations. A link will be posted here in the future when accepting new nominations. The first recipient of the award, in 1996, was Dr. Neal R. Amundson, after whom the award was named. Dr Amundson is Cullen Professor of Chemical Engineering and Professor of Mathematics at the University of Houston. A native of St. Paul, Minnesota, Neal R. Amundson received a master’s degree in chemical engineering and a doctorate in mathematics from the University of Minnesota. After taking his degree, Professor Amundson remained at the University of Minnesota, teaching both chemical engineering and mathematics. In 1949 he became head of the department of chemical engineering. It was a post he was to retain for the next 25 years, relinquishing it a short time before he joined the University of Houston’s chemical engineering department in 1977. Professor Amundson’s honors and awards are legion. He is a member of the National Academy of Sciences, the National Academy of Engineering, and the American Academy of Arts and Sciences. Professor Amundson has published six books and almost 200 scholarly articles. He has also been awarded four honorary doctorates. The most dramatic symbol of his many successes, however, is undoubtedly Amundson Hall at the University of Minnesota, which was named in his honor in 1980. The 1996 award was presented at ISCRE 14 at Brugge, Belgium. Dr. Rutherford Aris was the second recipient in 1998. Dr. Aris is Regents' Professor Emeritus in the Department of Chemical Engineering and Materials Science, University of Minnesota. Dr. Aris was born and educated in England. His early training was in mathematics, and his early employment was with I.C.I., where he encountered several problems (e.g. diffusion with reaction in catalyst pellets of arbitrary shape, venturi scrubber performance) that are the domain of chemical engineering. In 1955 he began a research fellowship in the Department of Chemical Engineering at the University of Minnesota. This eventually became a faculty appointment and an association that has continued, in a brilliant manner, to this day. Dr. Aris received a Ph.D. in 1964 in Mathematics and Chemical Engineering from the University of London. His dissertation became his first published book, The Optimal Design of Chemical Reactors, in 1961. His primary activity has been in the area of mathematical modeling, where he has brought to bear his remarkable skills, his expository virtuosity and his collegial generosity. The result has been an unparalleled body of work in such areas as fluid mechanics, separations and, of course, reaction engineering. Dr. Aris has been the author of 16 books, and author or co-author of more than 300 technical papers. We all continue to be taught by this great man. The 1998 award was presented to Dr. Aris at ISCRE 15 at Newport Beach, California. At NASCRE 1 at Houston, Texas in 2001, Dr. Octave Levenspiel became the third recipient of the Amundson Award. 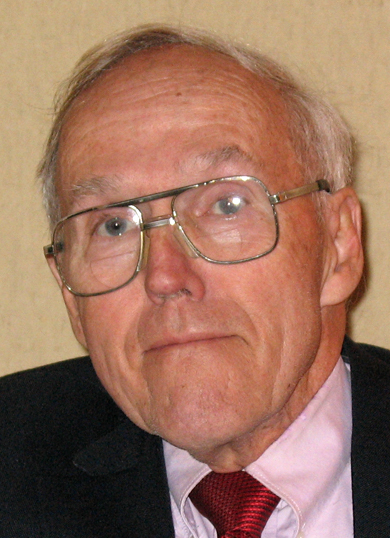 Octave Levenspiel is emeritus professor of chemical engineering at Oregon State University. His primary interest is in chemical reactors, and his teaching, writing and research aim at finding general principles and methods for designing these units. Dr. Levenspiel's other broad areas of interest concern heat exchangers and how to make the world of thermo-dynamics understandable. His pioneering book Chemical Reaction Engineering was the first in the field. It has numerous foreign editions and has been translated into 10 foreign languages. Today, after 37 years, it remains the standard and most widely used book, worldwide, on the subject. Other books by Dr. Levenspiel are The Chemical Reactor Omnibook, Fluidization Engineering (co-author), Engineering Flow and Heat Exchange, and Understanding Engineering Thermo. 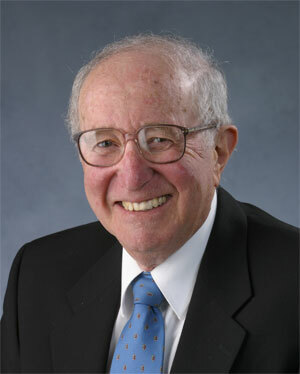 Dr. Levenspiel has lectured widely and has received numerous acknowledgments for his professional achievements, including the Education Lectureship Award from the American Society for Engineering Education and two awards from the American Institute of Chemical Engineers, the Wilhelm Award in Chemical Reaction Engineering and the Lewis Award for distinguished and continuing contributions to chemical engineering education. He has also received an honorary doctorate degree from the National Polytechnic of Lorraine, France, for his "international outstanding scientific reputation," and from the Colorado School of Mines. He is a member of the National Academy of Engineering. Dr. Vern Weekman's wide-ranging experience comes from his work with a single company, Mobil. He received a bachelor's degree from Purdue University and a master's degree in chemical engineering from the University of Michigan in 1954 before joining Mobil, where he spent his entire career. He won an employee-incentive fellowship to pursue a Ph.D., which he earned from Purdue in 1963. During his 42-year career, Dr. Weekman held numerous positions at Mobil Oil including director of its Central Research Laboratories, manager of Process R&D, and president of Mobil Solar Energy Systems. He is known for his pioneering contributions in applying theory to practice and for combining technological achievement with engineering education. His research covered a wide range of topics including design of trickle bed reactors, kinetics of multi-reaction mixtures, catalytic cracking and disguise of reactor performance due to deactivation. He lectured in many continuing education courses and is currently a Lecturer in Chemical Engineering at Princeton University. A past AIChE Institute Lecturer and President of AIChE, he also holds the R. H. Wilhelm Award in Reaction Engineering and is a member of National Academy of Engineering. He has also received an honorary doctorate degree from Purdue University. The 2004 award was presented to Dr. Weekman at ISCRE 18 in Chicago, Illinois. In 2007, at NASCRE-2 in Houston TX, Dr. Gilbert F. Froment received the Amundson Award. Dr. Froment is Professor Emeritus of Chemical Engineering at the University of Ghent, Belgium and is currently affiliated with Texas A&M University. Gilbert Froment's career and influence bridges the gap between academic kinetic and chemical reaction engineering studies, and application of that fundamental science to problems of industrial relevance. For example, his single event kinetics comprises an elegant approach to analyzing complex reactions of industrial import. At Ghent he ran a first rate applied kinetics laboratory with a guest book recording a who's who of industrial and academic kinetics and reaction engineering practitioners. And his book's ("Chemical Reactor Analysis and Design" with Ken Bischoff) rigorous approach to applying reaction engineering principles to real world problems in reactor design and analysis is an asset to both student and seasoned practitioner alike. With over 60 Ph.D. students and over 300 scientific publications, Gilbert has had a significant impact on the science and the practice of Chemical Reaction Engineering, and is a very deserving recipient of ISCRE's Amundson Award. Dr. Dan Luss was selected for the 2010 Amundson Award for his exceptional record of creativity, contributions and impact in advancing our understanding of the causes of steady-state multiplicity and dynamics of chemical reactors. This research led to improvements in the safer operation of industrial reactors and to a more reliable development and operation of novel reactor types. Professor Luss also made important contributions to the modeling of multi-reaction systems leading to many follow-up studies. His papers enriched the literature and led to insightful and intuitive solutions to very complex problems. He has a unique ability to employ highly advanced mathematical tools to obtain practical criteria and rules that can be readily understood and applied by practitioners. Dr. Luss is currently the Cullen Professor of Engineering in the department of Chemical and Biomolecular Engineering at the University of Houston in Houston, TX. The Amundson Award will be presented to Professor Luss at ISCRE 21 this June in Philadelphia.